When I talk about the Self-Compassionate approach to health and fitness, I talk about how leading with love and kindness isn’t about sitting around and eating bonbons (unless that’s really what your body, mind and soul need….if so, you know what I’m going to say…*no judgement*). Taking a Self-Compassionate approach to health is about honouring your needs and desires with kindness. Treating your body the way you’d want a loved one to treat their body. Kids plates are lovingly filled with a variety of foods including fruits and veggies. We’re conscious of not giving our kids too much junk food or sugar because we know it’s not good for their bodies. We ensure they get enough sleep and have the love and support they need to do the activities they love to do. We encourage them to move their bodies because it’s good for them. We also create healthy boundaries and help them course correct when necessary. We give them all the high fives but we also say no… a lot. Sometimes “momma bear” is less about finding food and shelter for your cubs, and more about protecting and motivating her to learn to fend for herself and grow to be strong and independent. At the end of the day ALL of this comes from a place of genuine care and compassion. What if we took this same approach with ourselves? What if having a Self-Compassionate approach to our health and well-being was about more than being tender and patient with ourselves? Recently I had the opportunity to take a 2-day Mindful Self-Compassion training with the founders of the course Chris Germer and Kristin Neff. It was extraordinary. In the course they introduced their relatively new construct of the Yin and Yang of Self-Compassion. And it blew my mind. Here’s my big take-aways and how I think you can apply them! What is Yin and Yang? The concept of Yin and Yang comes from Chinese philosophy. While the concepts of Yin and Yang are opposite in their nature, it is impossible to have one without the other. They are intertwined and interconnected. There are distinct Yin and Yang energies, but we cannot have one without the other. We can’t have light, without the recognition of dark. 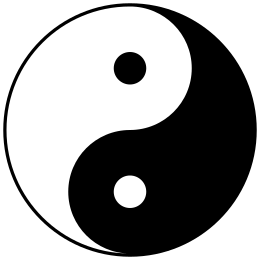 The symbol for Yin-Yang speaks to this interconnectedness by the white dot in the black side and the black in the white. Additionally, no matter how you “cut” the circle in half, you always retain both energies. They are synonymously contrary and complimentary. Self-Kindness: speaking to ourselves the way we would speak to a dear friend or loved one. Common Humanity: recognizing that we are human, and all humans struggle. Mindfulness: the capacity to notice the self-criticism and struggle and choose to respond with self-kindness. Self-Kindness: we fiercely protect ourselves, sometimes standing up to criticism or self-criticism and saying NO! Common Humanity: the empowering energy of self-support and the recognition that you don’t have to go it alone! Mindfulness: clearly seeing the truth and standing up and speaking up for ourselves. ALL. THE. YES! And I would say it’s not just women who need it…we ALL do! When they described this in our workshop I was so excited. YES! The Yang of Self-Compassion is POWERFUL. It’s using our self-criticism as a source of inspiration and motivation. At it’s core the Yin is about being with ourselves – giving ourselves space and grace to be with difficult emotions and experiences without being consumed by them. Yang Self-Compassion is about acting in the world. Stepping up protect, provide and motivate ourselves. It allows us to actively cope with life and all the many challenges and struggles that are part of real life! Acknowledge that you’re not alone, everyone experiences difficult emotions and experiences (common humanity)! 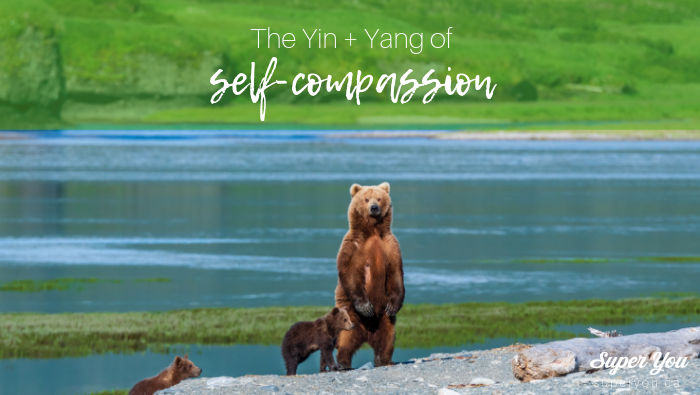 Respond in a way that feels right – the yin of self-compassion (tender, soft and gentle being with your experience) or the yang of self-compassion (fierce and encouraging taking action to protect, provide or motivate). Remember that just like the Yin-Yang traditional philosophy – when one is present, so is the other, so the practice is actually a balancing act of engaging both. Remember that sometimes self-kindness isn’t gently acknowledging your struggle and giving yourself space and grace. Sometimes harnessing that struggle (whether a noisy inner critic or a challenging situation) for your greater good and using it as the impetus to protect, provide or motivate yourself into action is actually the kindest thing you can do. Subscribe to Super You News! 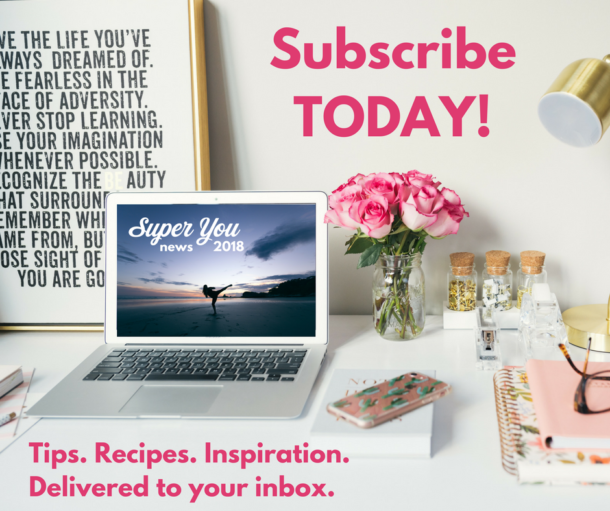 Super You News is a monthly publication that includes recipes, motivation and a monthly tip from me! Sign up here to receive it (don’t worry, I have a strict no spam rule, and you can unsubscribe any time)!